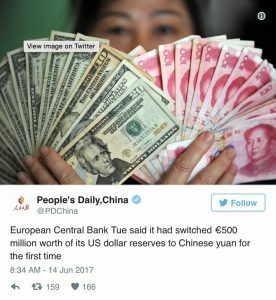 The European Central Bank Switched to Chinese Yuan for the first time! In what could be a major sign of things to come, the European Central Bank just switched to Chinese Yuan for the first time. Will this be the beginning of the end for the fiat US dollar? The European Central Bank has switched 500 million euros worth of its U.S. dollar reserves to yuan, reflecting the increased use of the Chinese currency and Beijing’s importance as one of the euro area’s largest trading partners, it said on Tuesday. “The ECB sold a small portion of its US dollar holdings, which remain the largest portfolio, leaving the overall size of the ECB’s foreign reserves unchanged.” The ECB’s foreign reserves now comprise US dollars, Japanese yen, Chinese renminbi, gold and SDRs. The investment also came after the IMF determined the yuan to be a freely usable currency and approved its inclusion in the Special Drawing Right (SDR) basket as the fifth currency, alongside the U.S. dollar, the euro, the Japanese yen and the British pound, the ECB said. Reuters is owned by the Jesuits through the Rothschild banking dynasty. The European Central Bank has started to hold foreign exchange reserves in renminbi in what amounts to a seal of approval for Beijing’s ambitions to internationalise its currency. The ECB invested €500m of its reserves in renminbi-denominated assets during the first half of this year, reflecting China’s importance as one of Europe’s largest trading partners, the bank said on Tuesday. While the €500m amount is just a sliver of the ECB’s €68bn forex reserves, the purchase of renminbi assets reflects the growing acceptance in Europe of China’s status as a global economic superpower — along with a desire to build closer ties with one of the world’s largest economies. The ECB is the most powerful central bank to date to invest in renminbi. The purchases follow a decision taken behind closed doors by the ECB’s governing council in January but not announced until the purchases were completed. The ECB also invests in dollars and yen as well as gold. It sold dollars to fund the renminbi purchases but still holds the majority of its foreign-exchange reserves in the US currency. 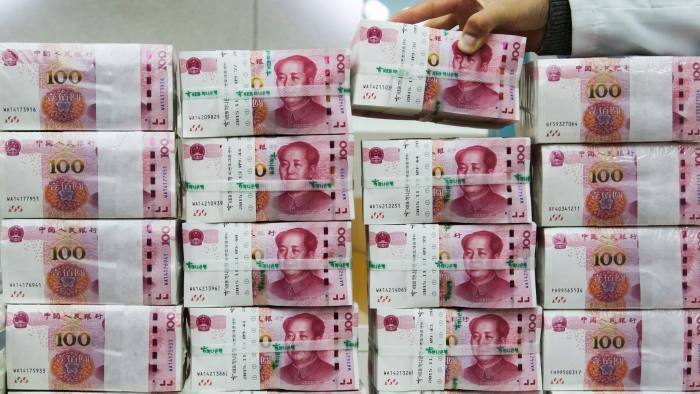 The popularity of the renminbi has risen since the International Monetary Fund in 2016 included it alongside the dollar, the euro, the yen and the pound in its “special drawing rights” basket of the most important global currencies. Other central banks including the Swiss National Bank have also bought assets denominated in the Chinese currency. As low-risk investors, central banks have tended to purchase safer assets such as government bonds. The ECB started to consider investing in renminbi as early as 2014, with a discussion in the governing council during the autumn of that year. As well as setting interest rates and supervising lenders, central banks are responsible for investing trillions of dollars in reserve assets, built up through interventions in currency markets and as a buffer to protect against liquidity shortages in foreign currencies. According to IMF data, public officials manage reserves worth $10.8tn. Some of those investments are held in the form of gold, but more than $5tn is in dollar-denominated assets such as US Treasury bonds, reflecting the US’s role as the sole global economic superpower during much of the latter half of the 20th century. Some $1.5tn is held in euros and smaller amounts, in sterling and yen. Purchases of China’s currency by global central banks have lagged behind its rise as an economic power — in part because of the restrictions Beijing places on foreign investments into China and the currency’s fixed exchange rate. A greater share of reserves is still held in currencies of smaller economies such as the UK, Australia and Canada. The official US dollar dumping has commenced. We who are not heavily invested in the banks have nothing to worry about. For as long as we have our own backyard gardens, and have downloaded the eTherapy ebook below, we can surely weather the storm.